Freedom House said 47 countries were not free -- just under one in four of the countries in the world. Washington (CNN) -- The unsolved murder of human rights activists in Russia. 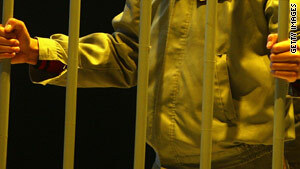 Their detention, torture and murder in Iran. Their jailing in China and Vietnam. Attacks on journalists in the Philippines, Pakistan, Mexico and Somalia. Coups in Africa and Central America. All isolated incidents around the world that together made 2009 a grim milestone in world freedom, according to a United States think tank that tracks liberty around the globe. Declines in freedom around the world outweighed gains last year, for the fourth year in a row, Freedom House says in its annual survey published Tuesday. "This represents the longest continuous period of deterioration in the nearly 40-year history" of the report, writes this year's author, Arch Puddington. There were only 116 electoral democracies around the world in 2009, the group found -- the lowest number since 1995. But the world is doing relatively well at democratic elections, compared with some other indicators. "Governments are more likely to permit relatively honest elections than to allow an uncensored press, a robust civil society, and an independent judiciary," Puddington writes. The report is not all doom and gloom. There was progress in Iraq, the Balkans, Malawi and Togo, Freedom House said. And taking the long view, the world was more free in 2009 than when revolutions swept the communist world 20 years earlier. The Central and Eastern European democracies born in 1989 have largely retained their freedom, despite economic pressures stemming from the worldwide recession. But much of the former Soviet Union is in a dire state. Central Asia is the least free region in the world, according to Freedom House, and contains two of the nine countries that got the survey's "worst of the worst" rating. Central Asia's former Soviet republics of Turkmenistan and Uzbekistan are on that list, along with North Korea, Libya, Sudan, Myanmar (also known as Burma), Equatorial Guinea, Eritrea and Somalia. This represents the longest continuous period of deterioration in the nearly 40-year history [of the report]. Ten other countries and territories fared only slightly better. They are Belarus, Chad, China, Cuba, Guinea, Laos, Saudi Arabia, Syria, the breakaway Georgian region of South Ossetia, and Western Sahara, which is fighting for independence from Morocco. 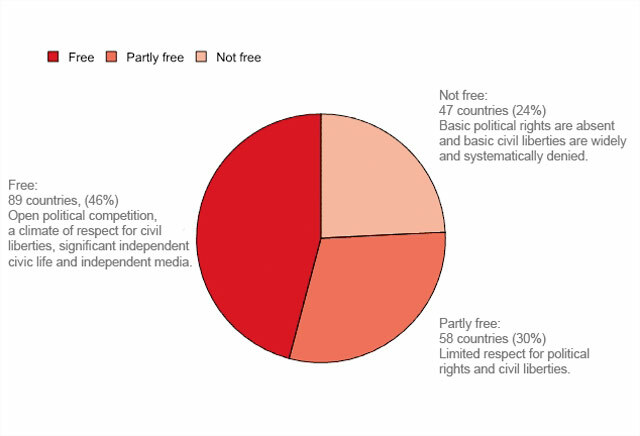 Freedom House groups countries into three categories: free, partly free and not free. A total of 89 countries were rated free in 2009. That's 46 percent of the 194 countries and territories in the survey, representing 46 percent of the world's population. Freedom House listed 58 countries as partly free. That's 30 percent of the world's countries, with 20 percent of the global population. The group said 47 countries were not free -- just under one in four of the countries in the world, but just over one in three of the world's people. China is home to more than half the people in the "not free" category, Freedom House said. Freedom House describes itself as a nonprofit, nonpartisan organization that supports democratic change, monitors freedom, and advocates for democracy and human rights. It has been publishing its annual report since 1972.